Last weekend, over a dozen players met up in GTA Online. They were all in decked out in trucks, jeeps, and other rugged four-wheel vehicles. They had one goal in mind: to cross the entirety of the Los Santos wilderness—rivers, mountains, forests and all. The rules were simple. The players would go on a cruise spanning the entirety of the map, on a course designed to test the limits of off-road vehicles (the only type of cars allowed on the tour). 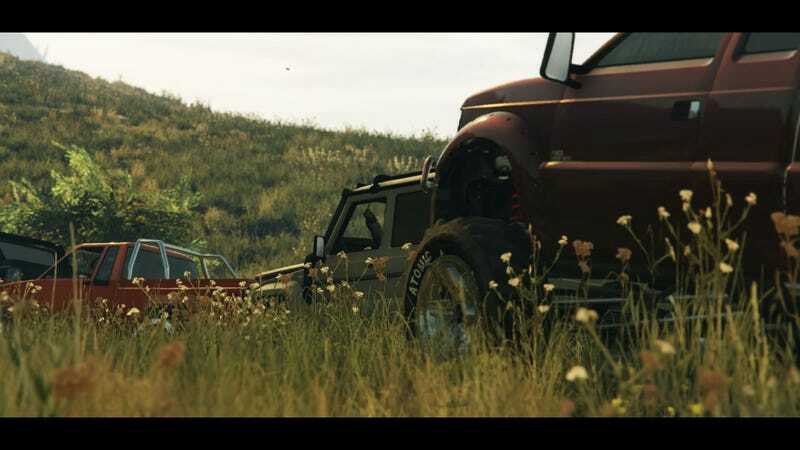 Throughout the cruise, if a player’s car got wrecked because of the terrain, they wouldn’t be allowed to just respawn a vehicle—they’d have to continue in the passenger seat of someone else’s car. The route contained four pit stops, which is where players would be allowed to repair their vehicles. All together, the tour would take at least two hours of driving. Yesterday, one of participants of the Off-Road tour posted pictures of the event on Reddit, and the journey looks like it was an amazing one. Coordinating all those people to drive through tough terrain, instead of having it all devolve into mindless shooting? Pretty impressive! So, too, are the pictures. At times, the tour seemed like something straight out of Spintires. Though there were casualties along the way, the tour did conclude successfully. Best of all, the tour awarded prizes to different players depending on how they drove, what their car looked like, how helpful they were, and who had the least-battered car. It sounds like the organizers are interested in throwing more of these types of tours too, which is great—it’s always nice to see what the GTA community can do when they come together with a single purpose. Flaherty says that to develop the route, he cruised through the map on a plane and marked areas that seemed of interest. Then, he tested them out in a truck to see if it was possible to actually traverse the area. Eventually he settled on the tour that you see in the pictures above—a challenging course, but not impossible. You can check out more awesome pictures of the GTA Off-Road Tour here. Those of you interested in partaking in an event like this in the future should definitely check out the GTA Offroad subreddit.